A classic soup with fun circle noodles for the whole family! 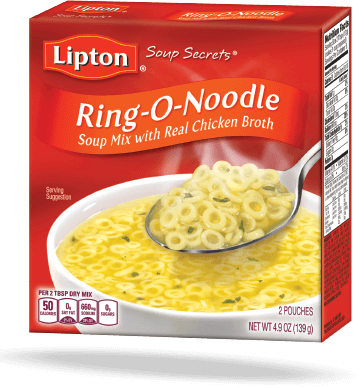 Ring-o-noodle - Soup Mix with Real Chicken Broth is rated 4.3 out of 5 by 61. Rated 5 out of 5 by Anonymous from Honestly, I can say I love this soup. I can see myself eating this every time I get sick. Even when Im not sick, and its nice and cold I would eat it again. I have to say the ring Os were cooked very well and the soup itself taste great. Its not too salty and its definitely not too tasteless. You can definitely taste the flavor and thats what I love about it. You can even add your own little ingredients here and there and I feel like it would ruin the flavor. I usually add lemon on my soup, or even a little salt. Although I didnt feel like I had to on this one. Also if you dont add enough water (like what it says in the box) I feel like it make taste a little salty. So try to add enough water to it. Definitely recommend. Rated 5 out of 5 by Anonymous from Just like my previous Lipton soup review. I was skeptical. This version is just as tasty. I personally enjoyed both. The only difference is the noodles. However, if I had to choose, I would prefer the rings. Lol I guess thats just the kid in me thou. The rings also have same calories. So, 2 packets is only 120 calories! Can we say bonus! I received this as a complimentary gift voxbox from Influenster for my honest review. Rated 4 out of 5 by teawithaunicorn from I received this as part of a Voxbox.This is a good soup base that doesn't take up much room. The flavor of the chicken broth is pretty good and builds well with other flavors. I took a jump and used it to make egg drop soup and it went really well. Just need to remember that there is enough salt in the mix already so slowly add in any other products that also contain salt. Rated 3 out of 5 by mob2065 from I was sick with a cold when I made this, so it worked out great. And I know on the box it says to chop up a bunch of vegetables to make it a whole meal, but Im assuming most people who buy this dont want to do any extra work. Therefore, I give this 3 stars because, even though there wasnt much to the soup, the broth was AMAZING!!! Perfect for sipping when under the weather! Rated 5 out of 5 by shelbyp from Super easy to make, taste great. I honestly think it taste better then can soup, has more of a fresh taste. I didnt try to add anything extra, like how the back of the box shows a recipe. Wanted to try it "plain" before spicing it up. I think it would taste even greater with some added veggies, I will try that next time. I received this item as a sample to test. 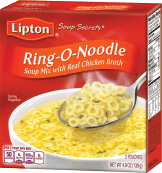 Rated 2 out of 5 by joanneh from I received these in the Lipton Soups voxbox, and I really was excited to try this soup, but it's also pretty bland, as the noodle soup is. I ended up trying this soup with a cup less of water than directikns recommend and it was still pretty bland. Not too impressed with these because they are so lacking in flavor. I wouldn't buy these again. Rated 5 out of 5 by meganacaa0 from This was giving me to free from Influenster, so Im so thankful for that. I wouldnt of tried it with out them. This was so easy to cook! 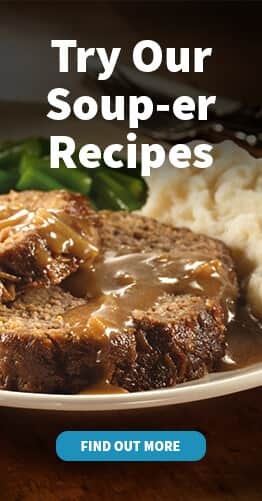 Im a college student so an easy home cooked meal is great! I added celery and carrots for some veggies, then I added Cayanne pepper for some spice. I would definitely buy this next time I go to the store!